Our daughter, Avishi has been diagnosed with MPS Type VI (Mucopolysaccharidosis Type 6) - a very rare, debilitating & life-threatening genetic disorder. If left untreated, expected life span would be age 20 to 25 years with deteriorating body condition every year. 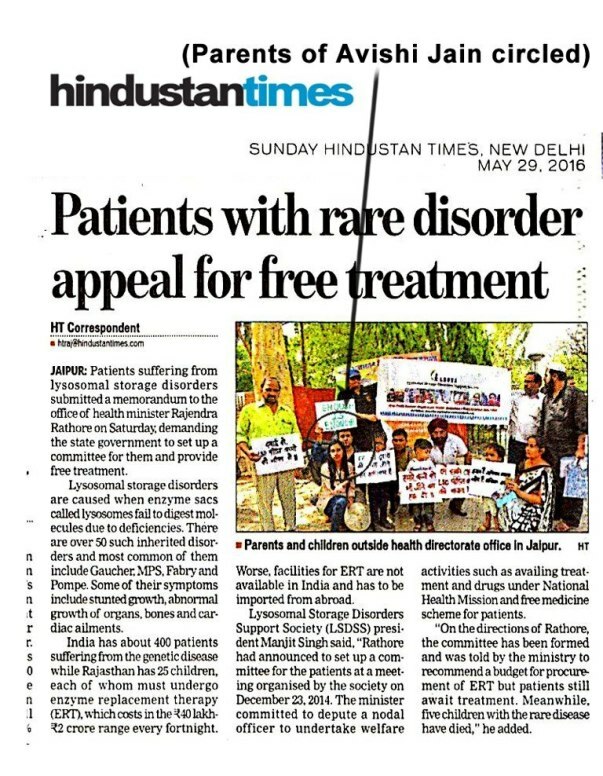 Unfortunately she cannot receive treatment for this rare disease in India, as there are no expert medical centers with experience, cutting-edge technology and research for MPS. 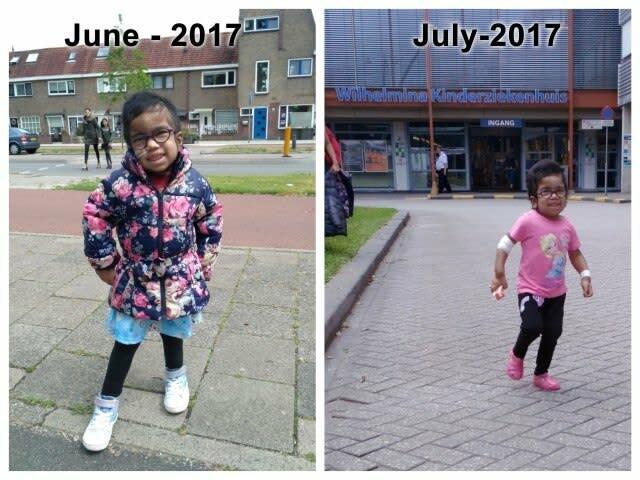 We need to quickly move her to UMC Utrecht (Netherlands) for required treatment. 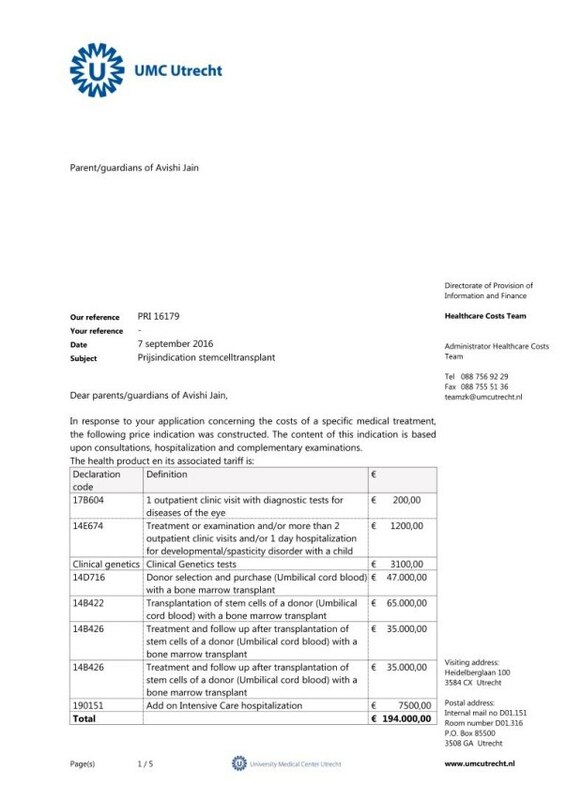 The hospital cost is (1,94,000 Euros or Rs. 1.47 crores). Add another Rs. 48 lakhs towards living expenses for 1-year at Netherlands. Total cost of treatment is Rs. 1.94 crores approximately. We have tried knocking many doors with government authorities in India, met health minister of Rajasthan many times, newspaper & media coverage etc. 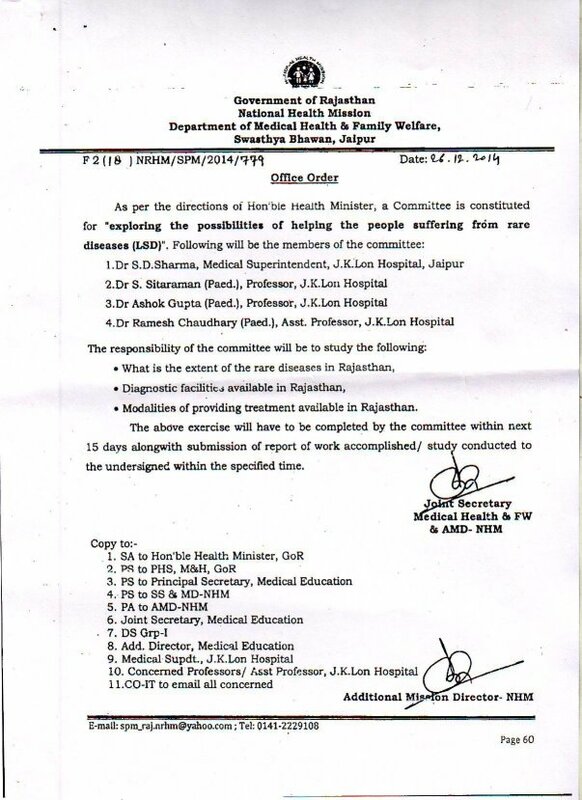 A Government Committee was also formed by Health Minister of Rajasthan to look into the matter, but to no avail. Your donations will go towards easing the burden of Avishi's treatment, medical care and incidental costs associated with a long stay away from home over the next several months. We need to act very quickly as the count goes in days. During this difficult journey, your prayers and support will make a lot of difference. We look forward to seeing Avishi grow up normally, run around with the wind in her hair, dance with her parents at her wedding and enjoy everything that life can offer. Thank you so much for your love, support and generosity ! At the outset, I am happy to inform you that Avishi is doing much better now and is on her path to recovery. 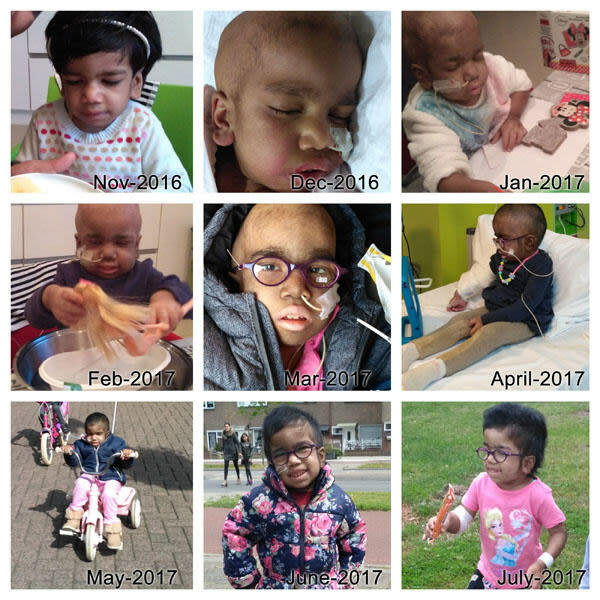 The treatment has been going well and the enzyme "Arylsulfatase B" which was missing from her body (responsible for her rare genetic condition MPS Type 6 / Mucopolysaccharidosis Type 6) is now being produced by her own body in adequate quantity. We are still at Netherlands and the treatment will take some more time. My due apologies for not being able to update you in the past months as we were going through the ups and downs associated with such a treatment. In this update, I will try to recap all the past months since my last update to you. Avishi was admitted to the hospital on 14-Nov-2016. After preparing her body for the new donor cells cells using Immunotherapy and Chemotherapy (which kills existing cells to make space for the new cells), the Stem Cell Transplantation took place on 25-Nov-2016. As mentioned in previous post, a Central Line (Hickman Catheter) was put on first day of hospital admission through a minor surgery on the right side of her chest. In the hospital room, they connected multiple IV Infusion lines to the Central Line. 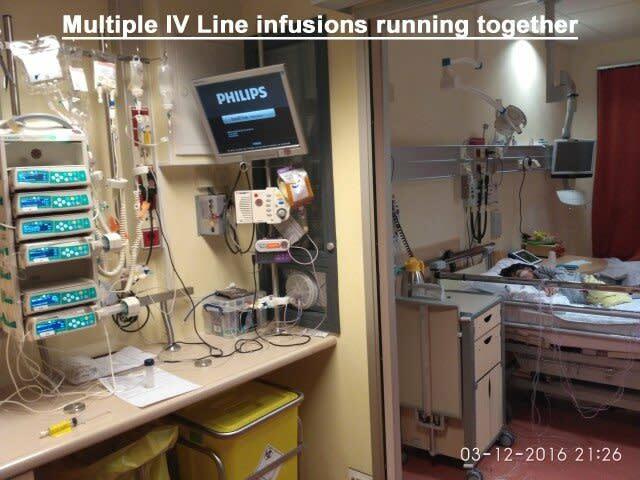 It started with two IV Infusion lines and there was a time when there were eight intravenous infusion lines connected at the same time through multiple extension connections. All the medicines were being given through these lines and her body was in a state of zero immunity (as her original body cells were destroyed or depleted to make space for infusion of new cells). Due to this, we were always in sterilized clothes (gowns/aprons) and wearing masks. Even the doctors and nurses used to come inside the room wearing aprons and masks. The main process of transplanting the cells or infusion of new cells in Avishi's body was done on 25-November-2016. There was a lot of fear and anxiety as to how her body would react to the new cells. The first thirty minutes after infusion of new cells are very critical. Thankfully there were no complications and the infusion of new cells was declared as completed. These donor stem cells, once inside the body, slowly grow and multiply over a period of time. During the hospital stay, Avishi went through a lot and at times it was just not possible to come to terms with what was happening. Stem Cell Transplantation is a very difficult and painful process. She had a lot of stomach pain, diarrhea, fever, rashes on face and skin etc. She lost all her hair on the head as an after effect of Chemotherapy and her skin color also began to darken due to the same. She lost all appetite and hardly used to eat anything orally. During the entire hospital stay, she had constant loose motions and nausea/vomiting. This was due to all the strong medicines being given. She used to wake up multiple times in the night. Her blood levels were being monitored on a daily basis, sometimes twice a day, to look out for any infections or contraindications. On multiple occasions, she was found quite low on haemoglobin and platelets, due to which Avishi had to be given multiple infusions of blood (rbc) and platelets. 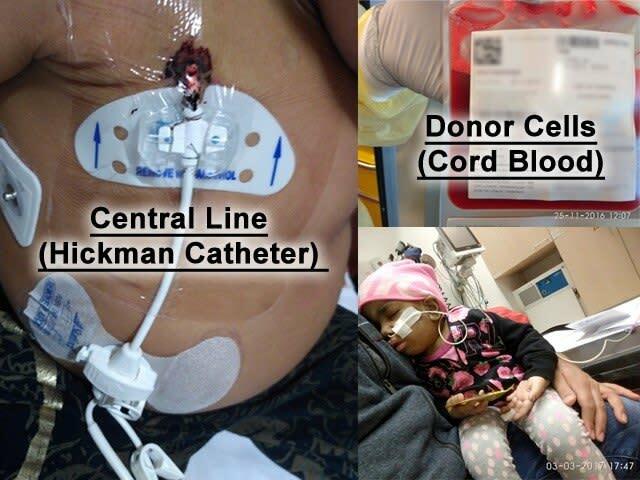 She was given a total of three infusions of blood (rbc) and another three infusions of platelets. Avishi was very brave in facing all these and we always used to tell her that all these is being done to make her stronger. But gradually, she was tired of the four walls of the hospital room as she was not allowed to move outside the room for fear of infection. 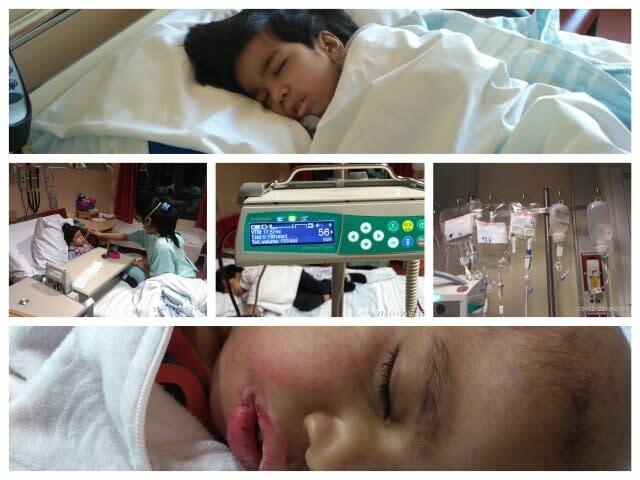 Our son, her younger brother was also not allowed inside the room nor anywhere in the stem cell ward. Avishi always used to ask, "When will I go home... When will I get to play with my brother again?". 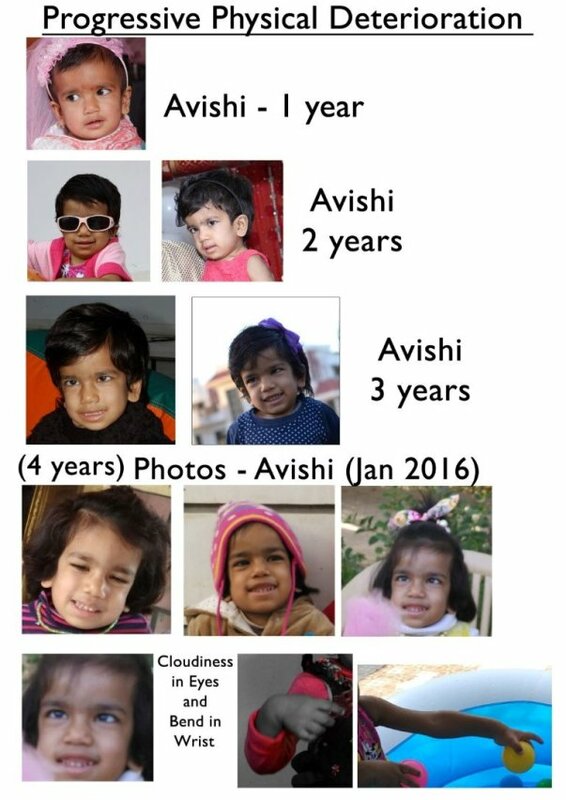 Avishi was admitted to hospital on 14-Nov-2016 and discharged on 23-Dec-2016, which was three weeks earlier than expected schedule. It was Christmas time and it brought Avishi the gift of a healthy and MPS free life. 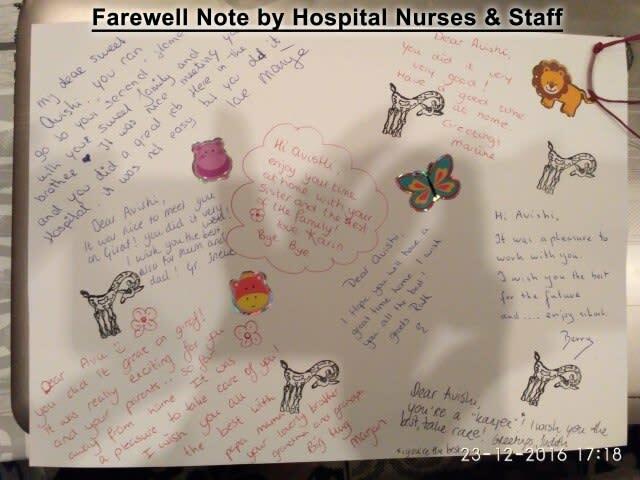 We reached home around afternoon on 23rd December and had got some toys as gifts to welcome Avishi back home. I cannot express in words, how happy Avishi was that day to be back home after the long hospital stay. She smiled and laughed for the first time in last two months. She literally ran around the house and was dancing on the Merry Christmas song which we had put on our mobile. She was so so happy to be out of the hospital room and so were we. During the hospital stay, they inserted a feeding tube into Avishi's nose which went down from her throat to food pipe to stomach. This was to take care of her food and nutrition. It was a terrible experience inserting the tube and the first three attempts by nurses failed. Avishi had a lot of bleeding in the nose too because of these unsuccessful attempts. 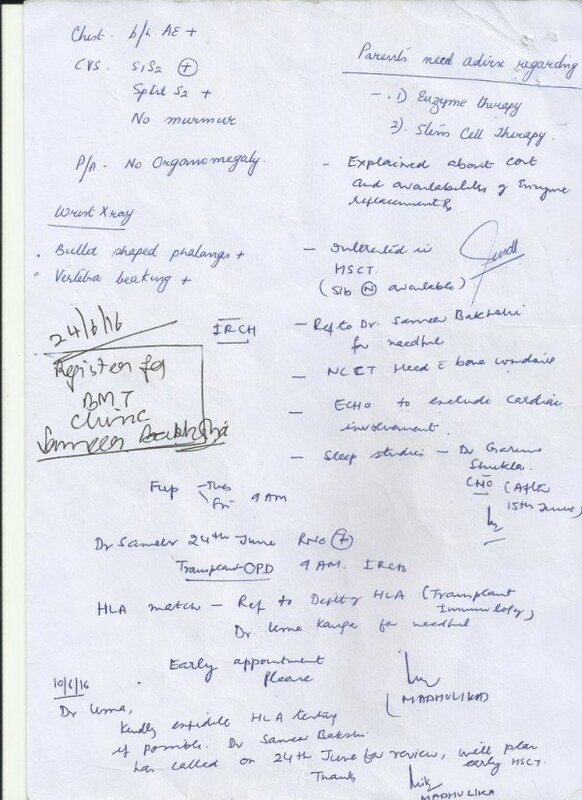 Finally, the tube was inserted next day by a team of ENT doctors using guidance of a tiny nasal camera. The feeding tube was connected to a feeding pump machine which used to give her medicated liquid food 24/7 at a slow constant rate. It was on even during sleep. This feeding tube continued even after the hospital discharge, so as to take care of her food and now her medicines back home. Avishi had eight medicines to be taken twice a day, which was all being directly injected into the feeding tube using syringes. Avishi was given syrup based medicines as well as tablets which had to be crushed and mixed with water before injecting. Thanks to the feeding tube, it would have been otherwise impossible to give so many medicines every morning and evening to such a small child. Avishi also got a back pack type of bag which contained the feeding pump machine, connected to her nasal feeding tube. The bag used to be there with her always 24/7. We had to change nutrition packets two times a day on the feeding pump machine. The bag and the feeding tube restricted Avishi's ability to freely move or walk around, as the tube had to be taken care of not being accidentally pulled out from her nose. This was also quite a botheration during night time while sleeping. The feeding tube needed to be changed / replaced every six weeks to alternate nostril and it was a a harrowing experience getting a new feeding tube inserted into the nose, at the hospital, again and again. Even after coming home, Avishi was not allowed to go outside as she had a very weak immune system. She was advised isolation or in other words, restricted to her house for the next six months and whenever we used to visit hospital, she had to put on a protective mask. The only exception was being allowed to go to a park in the open air (again with a protective mask) when there was no crowd. The doctor had asked to maintain utmost hygiene at home and said that in case we fall ill or her little brother falls ill, we should not be in the house. Thankfully, that situation never arose. After being discharged from hospital, we used to visit the hospital once or twice a week for scheduled checkups and tests. The regular checkup frequency was gradually brought down to once in two weeks and now once in three weeks. Every visit, extensive blood tests are performed (around five to six tubes of blood sample taken) so as to ascertain all vital parameters. Avishi gets really upset and starts crying whenever we have to visit the hospital, as she knows another prick is coming. We always have to convince her hard to go to the hospital. Avishi's haemoglobin was found low ever since she came out of hospital (in the range of 4.5 to 5.5). In the last week of January, Avishi was found low on immunoglobulin too and was given an IV line infusion by admitting her to day care in the hospital. After a month, she was again found low on Immunoglobulin. Owing to this, the doctors decided to put her on a regular Immunoglobulin infusion schedule. Avishi had to be admitted to hospital day care once in every three weeks for the infusion. She has been given the last dose of immunoglobulin infusion on the 5th of this month (05-July-17) and now the doctors will monitor if the levels stay stable or go down again. Back from hospital to home, Avishi almost stopped eating orally by mouth and was dependent only on the tube feed, but thankfully she did not loose weight. The medicated liquid nutrition feed took care of her body dietary requirements. She had some swelling in her body post hospital discharge, which gradually settled in few months. She had a lot of difficulty sleeping and hardly had a sound sleep. She used to wake up multiple times in the night at home too. The loose motions also kept disturbing her for the first four months after discharge and finally settled around April. Avishi used to ask for a tricycle after coming from hospital and we finally got her one after a month. The first time she sat on the tricycle, she started pedaling and riding it, which was a big surprise for us. Earlier before treatment, she had a tricycle in Jaipur too but was unable to pedal it due to lack of adequate strength in her legs. She just used to sit on the tricycle and we used to push and drive her. But surprisingly, she drove it with full strength in one go now. Gradually she has improved a lot in this aspect and now Avishi can ride a tricycle for as long as half an hour at a stretch. We can see her gaining strength in her body including other minor and gradual positive changes. Avishi is doing much better than before now. She is physically quite active now - plays cheerfully and keeps running around the house. She is able to jump on two legs on her own (unlike earlier) and has no inhibitions or fear while running or moving around. She loves colouring and does it very good now (the colours don't come out of the margins now). 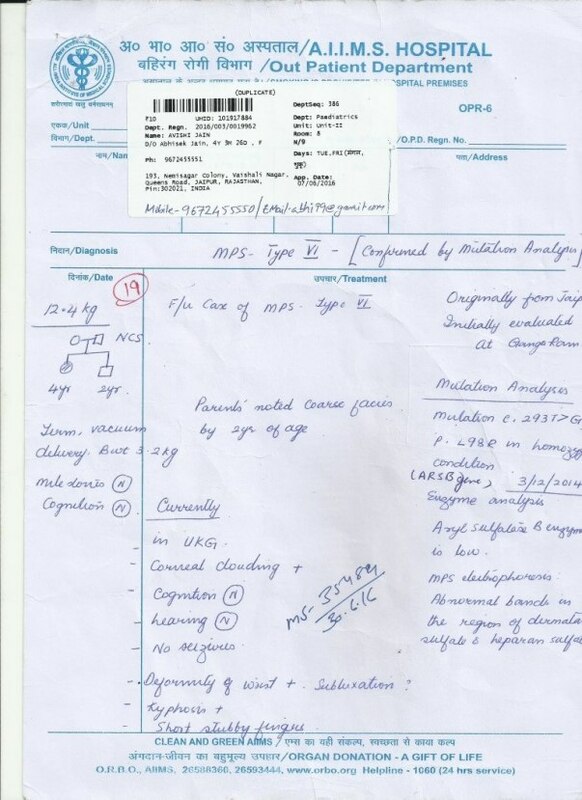 Her blood reports and vital parameters like wbc, leukocytes, neutrophils etc. are getting better and better. She is regaining the lost hair on her head and now has small hair/a boy cut kind of look. She had become completely bald during the treatment due to after effects of chemotherapy. She has also been prescribed glasses, which are helping her to read/write better, colour better etc. She is slowly developing her appetite also. Her feeding tube has been removed in the last week of June and now without the nasal tube and nutrition machine back-pack, she finds herself a free bird, no more worrying about the tube while walking, running, playing, sleeping etc. We did have bad experiences as the tube came out accidentally on three occasions, making us rush to hospital for replacement. Moreover, her cheeks were always red and sore due to being constantly covered with tapes to keep the nasal tube in place. They used to itch a lot and sometimes even bleed, requiring constant application of skin ointments on her cheeks. Thankfully, Avishi does not have to bear with the feeding tube and it's associated discomforts now. Her isolation advice also has been taken off and she is now allowed to go out, move around, play outside etc. Her medicines are tapering down. She has come down from eight medicines to three medicines at present. The most critical medicine (Immune suppression medicine - Ciclosporine) has been stopped. The new cells after the Stem Cell Transplantation are adapting/integrating well with her body. Her immunity is improving and should hopefully restore to normal in coming months. Another aspect of stem cell transplantation is that a child has to be re-vaccinated from the beginning again like a new born child. Due to stem cell transplantation, all the vaccinations given earlier are nullified/erased. Avishi's vaccination schedule has just started and she got her first vaccine two weeks back. There are some minor concerns also at present. Her haemoglobin levels are still on the lower side (hovering in the range of 5.4 to 5.9) and the doctor says that it may take some time to normalize. There is a lot of dryness of skin and some rashes on her skin (on and off), which the doctors are monitoring in case they spread further. She has also been recently diagnosed with a minor umbilical hernia (stomach side), which the doctors say can be taken care later. It doesn't cause any pain or trouble for now. She is slowly getting used to eating normally by mouth as she was on nasal tube based feeding for a little over last six months. Her weight is also being monitored and hopefully she will start gaining weight now, it is not going down thankfully. Overall, it has been a very humbling experience. The treatment has progressed very well and we are more than happy with the pace of her recovery and the positive changes in Avishi. This is the biggest miracle of our life and the entire experience has made me firmly believe that miracles do happen and they happen in this world only. It still feels like yesterday that we were hoping and praying for Avishi's treatment to become a reality. With all your prayers and God's graces, Avishi is on the right path to recovery. I once again whole-heartedly thank each and everyone of you who have supported us in this endeavour to make Avishi's treatment a reality. I truly do not have enough words to thank you and without your support, this would have never been possible. Thank you so very much for your support, wishes, prayers and blessings. Thank you so so much for everything. Seeking your blessings and wishes always. I would first of all like to extend my heartfelt gratitude to all of you for your support and constant prayers. It is all thanks to your help and support, Avishi has been finally admitted to hospital last Monday (14-Nov-2016) in Netherlands and her long-awaited treatment has started. All her prescreening tests/examination reports went fine. 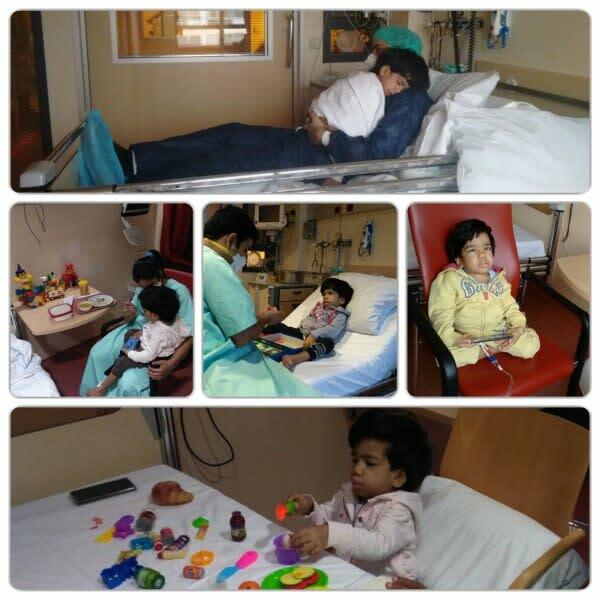 Avishi is currently at UMC Utrecht (Netherlands) in it's children's hospital known as Wilhelmina Children's Hospital. I could not keep you posted in the interim period as we had to arrange for the travel, close our residence in Jaipur, do the medical visa formalities at Netherlands Embassy in New Delhi etc. Even after reaching here in Netherlands, it was a challenging task finding a house on rent (with direct bus connectivity to hospital) and we had to change accommodation twice (Airbnb temporary houses) before finding the third and final house on rent. Before the final hospital admission last Monday, there were a lot of pre-screening tests and multiple visits to the hospital. I would also like to share an important update. In order to help us achieve our crowd-funding goal faster, another crowdfunding website - BitGiving has come forward to help us and started a campaign in collaboration with Milaap. Avishi's crowdfunding campaign on BitGiving is being supported by News18 / CNN News18 (formerly CNN IBN) TV News Channel. It is for the first time that two crowdfunding websites have come together in India to help a campaign reach it's goal faster. CNN News18 network is helping by mentioning Avishi's cause on it's digital media, social platforms etc. and a probable television mention in coming days. 1) Central Line (Hickman Catheter) put on first day of hospital admission [Monday, 14th November] on right side of chest. This will be there for next two months and will be used for administration of all kinds of injections, infusions, medications, as well as for the withdrawal of blood for daily tests etc. 2) Immunotherapy started last Wednesday [16th Nov] and got over last Saturday [19th Nov]. 3) Chemotherapy started last Sunday [20th Nov] and last/final dose will be today [Wednesday, 23rd Nov]. 4)Stem Cell Transplantation coming Friday (25th Nov '2016) -THE BIG DAY ! Avishi has been responding well to the treatment. The hospital, it's doctors and nursing staff are taking good care of Avishi. The hygiene levels are being maintained very strictly and we have to wear gowns/aprons and masks all the time in the room and sanitize our hands at three levels before entering the room. The room has got air filters & air purifies and two doors / two levels of entrance to keep away infections/viruses/bacteria etc. Avishi has to stay inside the protected environment of the room all the time and cannot go outside the room. We try to keep Avishi busy / distracted with the help of toys. I do not have enough words to thank all of you for your support and for making this treatment a reality. I will keep you posted with Avishi's treatment progress. Hoping and praying for the best. Seeking everyone's blessings and wishes. At the outset, I am deeply humbled by your prayers, wishes and all the support coming in on Milaap from India as well as abroad. Avishi is keeping well generally, except for a viral fever last Thursday, which cured and again re-lapsed this Monday. The doctor advised to test her for Dengue, which thankfully turned out negative as per test report yesterday. She still has post-fever weakness but is much better today. Your prayers and wishes are helping Avishi sail through all such situations. We stand at 1550+ supporters on Milaap as I write to you. We have been trying for Corporate Support, writing to leading I.T. companies and other prominent organizations in India. I want to share some positive developments on this aspect. 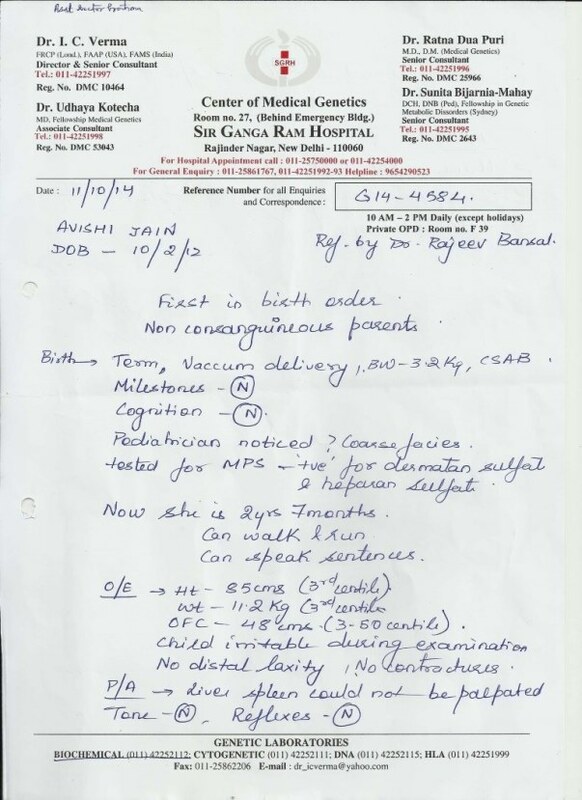 I am happy to share with you that the Sarojini Damodaran Foundation (SDF) has come forward for Avishi's cause in a big way, contributing INR 10 lakhs for Avishi's treatment. My heartfelt thanks and deepest gratitude to SDF for such a benevolent gesture. This is a huge contribution and helps significantly. I would also like to thank my dear friend and batch-mate from T.A. Pai Management Institute (TAPMI), Jagat J Saikia, for his untiring efforts in channelizing this and making this possible. The Sarojini Damodaran Foundation emerged from a sense of responsibility towards society. It is this driving force that inspired Kumari Shibulal & S.D. Shibulal, ex-CEO of Infosys and one of it's co-founders, to lay the founding stone of SDF in 1999. The Shibulals' love for children and the need to give back to society has found fruition in a number of charitable endeavours, and the same is reflected in their coming forward for Avishi's cause. SDF started off on a small scale, providing scholarships to a few underprivileged students in Alappuzha, Kerala. Today, SDF is a constantly growing entity expanding its reach to various causes including education, cardiac care, pension projects, nutrition, organic farming, art and culture, in different parts of the country. Another support has come in from Nearbuy.com (formerly known as Groupon India). Nearbuy has partnered with Milaap to promote this campaign on it's website. All contributions accumulated on Nearbuy will be transferred to Milaap. I whole-heartedly thank everyone for their immense support. Every child deserves the gift of life. 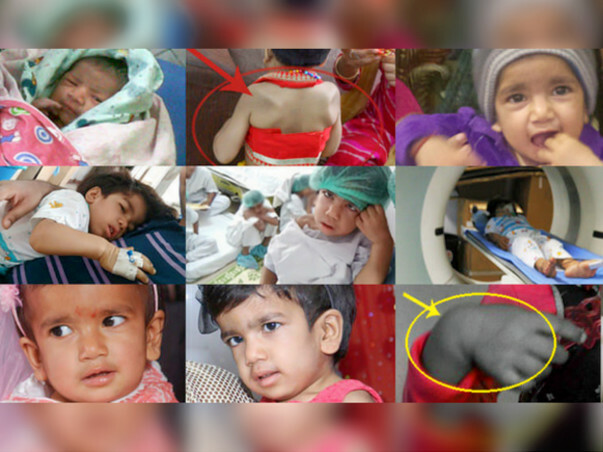 Your generosity is making an immediate difference in the life of Avishi and in getting her the right treatment. We are in the process of planning our travel to the Netherlands and shall keep you posted once the dates are finalized with University Medical Center Utrecht.